The guitar on Border Reiver is tuned to Eb (one half tone lower than standard tuning). On the 2008 tour he played one Strat with 010 strings on What it is and Sailing to Philadelphia, and another one (owned by Glenn Worf) with 009s on Sultans of Swing and Romeo & Juliet, might be similiar on this tour. The following songs seem to be the ’58 Les Paul. I can’t tell if the ’59 was also used. I first listed So far away for the MK Signature Strat, because of this video (bad quality, red or sunburst Strat?) but on all other ones I have seen so far it it the sunburst ’54 Strat. A rather new addition to Mark Knopfler’s collection. I cannot tell which guitars he played on the following songs. If you have been to the US tour or know more from other sources, please use the comment function to let us know. On Prairie wedding he usually played with his 54 telecaster. Due to the hum coming from its PU, in a show (cannot remember which one) he used the Pensa Mk2, I think the new one that Rudy gave him during 2005 tour. Remembarance Day and Coyote: definitely a Les Paul, would say his trusty ’58. Judging from pics from the US tour, I think he mostly used his ’58 (it’s more faded as the others). Looking forward to see Mark and his band in Amsterdam!! Sorry, forgot to fill in my name and sofort. However, I really like it that Knopfler takes his precious guitars on the road! Yes, the ’58 is used more. You are right, the ’59 has more red and more flame, in 2008 it was used e.g. on Why Aye Man & Sonny Liston. 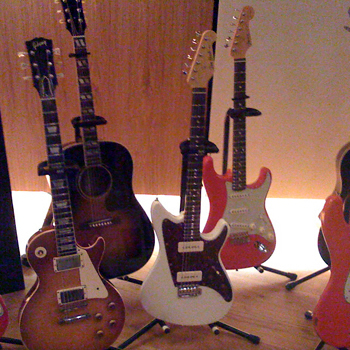 I am not sure if Mark has as many valuable guitars on this tour as on previous tours. This idea came up when I saw him playing So far away on a MK signature Strat instead of the ’54, so possibly he left some (’54 Strat, ’54 Tele, ’59 Les Paul??) at home. I meanwhile checked some more videos of Si far away and it is the ’54, so forget about the last comment. p.s. Ingo, is it me or are they playing the songs more like the originals? Too bad they don’t do Rudiger! Hi Ingo, just a little addition: The red strat for Border Reiver seems to be tuned to Eb. See http://www.youtube.com/watch?v=hIO9MMWCogY from 2:00. Thanks for your comment, you are right with Border Reiver, I added this to the article text. Thanks for such interesting information! 1 question: do you know what kind of pickups are installed in Mark’s “Telegraph” Pensa? I think they are Lindy Fralins or Texas Special but I am not sure. Marks using the pensa mk2 plus for TR (since 2005) which has Lindy Fralin Custom pickups. Actually he used his mk2 plus since Milan (Italy) date in 2005 on TR. But on 2008 and current 2010 tour he uses the “standard” mk2. You can clearly see it by the lack of the white binding. I think he used the mk2 plus only one time douring this tour on prairie wedding, due to the hum coming from his 54 telecaster on that particular venue. due to So Far Away: When you take a look at the Manchester gig you can see that he plays a red Strat (maybe a MK Signature Strat or the one like on the Phil Cunningham interview which hasn’t got a signature of Mark). He’s been using up to 4 red strats in one concert. I was at the manchester gig where he played a red MK signature on So Far Away (think there are hum problems with the ’54). For Border Reiver he uses an MK Sig tuned to Eb, this is then changed for What it Is and Sailing to Philadelphia for a standard tuned MK Sig. For the end of Romeo, and Sultans, an MK Sig with light (.009) strings is used. The fourth MK Sig comes out for So Far Away if necessary, with a tremolo arm attached. Just came home from the first gig in Amsterdam. He only used one Les Paul, the gorgeous ’58 of course (very faded with a few flames here and there). Pensa for the outro solo of Telegraph Road. 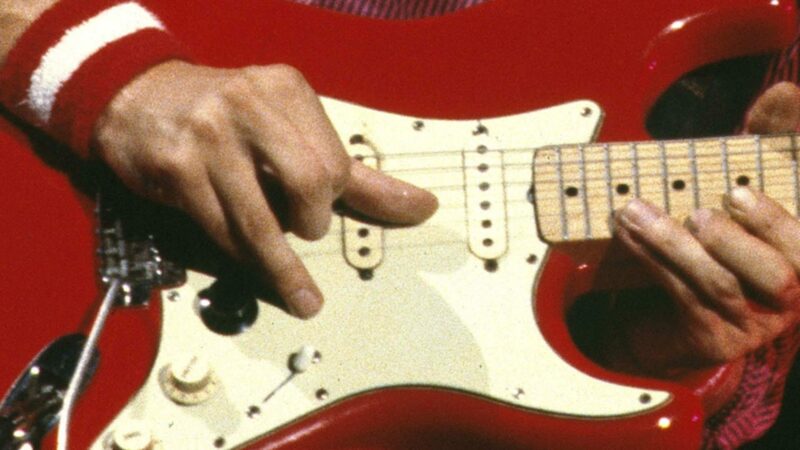 His Signature Strat for all the others… Border Reiver, What It Is, Sailing, Sultans, Romeo and Juliet, So Far Away. The newish Don Grosh guitar for Piper on The End and a rather new looking Telecaster for Prairie Wedding. I’m 30 years old and if I had to play every day about total 60 concerts I had played them on a bed.. And if I were 60 years old I had played them from the hospital.. So hi is strong man. I’m glad for that…. – Although I was pretty close, I was not able to verify if the National used was the orignial one or not. – during the outro of Coyote, he played a lick from 3on Broadwasy” like he ued to do in Calling Elvis some years ago. I read somewhere that he played also licks from MFN, but I can’t recall. – he played ole ole just before Sultans ! – At the end of Sultans, he played like on the studio version : the end fast lick jsut after the “descending” scale, without the few bars he played since the single pathways version ! He did this way in sept 09 at the prince trust. I don’t kniw of he did this in 2008. It seems he wants to go back to “original” sound of Sultans, although he played some licks from Alchemy. – Telegraph road was of course on pensa, but I remember in Lyon05.04.2005, he played it on the sig strat (I understodd it only the next day, during concert i Thought it was the original 61 !) bevause he git the pensa only in june 2005 I guess (in Italy if memory serves). I found a bit shame that the first solo was a bit flat : it lacks some lead instrument. I like the idea to keep the national until “..moving slow”, but in 91-92, the sax tokk the lead part, and I found it very nice. Here, it could have been a flute, rather than 2 strings instruments (cittern and mandolin). And I dindn’tlike Richard’s licks during the first part of the song, nor his licks at the end of Romeo. A question about the Don Grosh : the PU looks like P90 or am I wrong ?